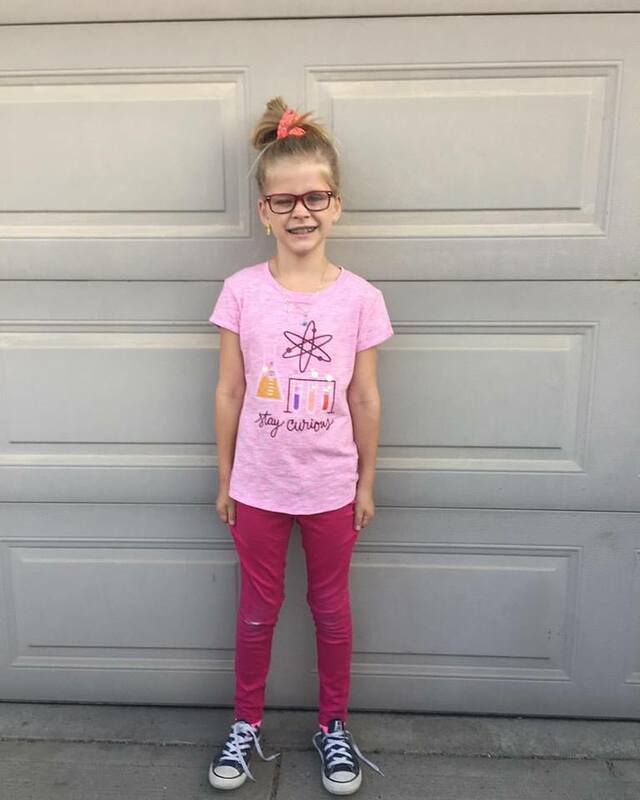 sweat like becky: Back To School! 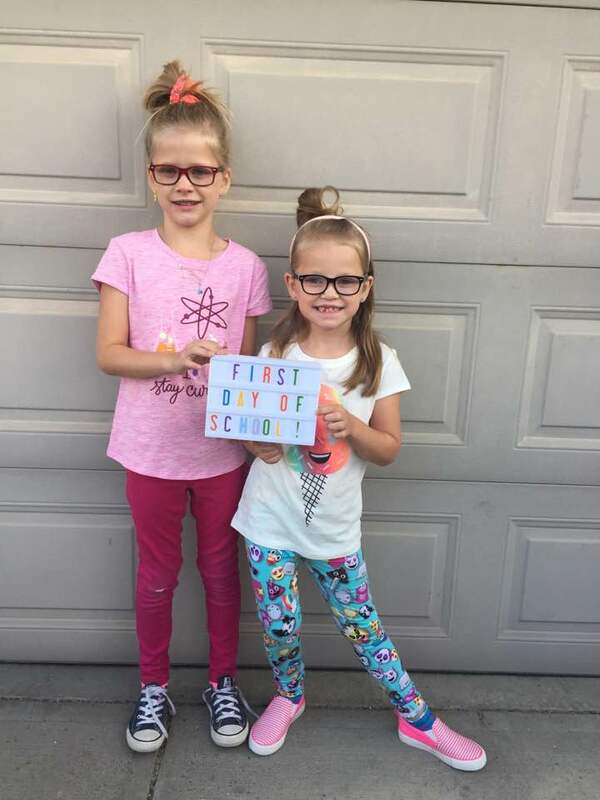 Yesterday was the first day of school for the girls and we were all counting down to this day - all for different reasons haha. This will probably be the easiest morning to get them out of bed until the last day of June haha. Everybody has fancy signs but we went simple using our mini cinema box with colourful letters because that is how I roll haha. 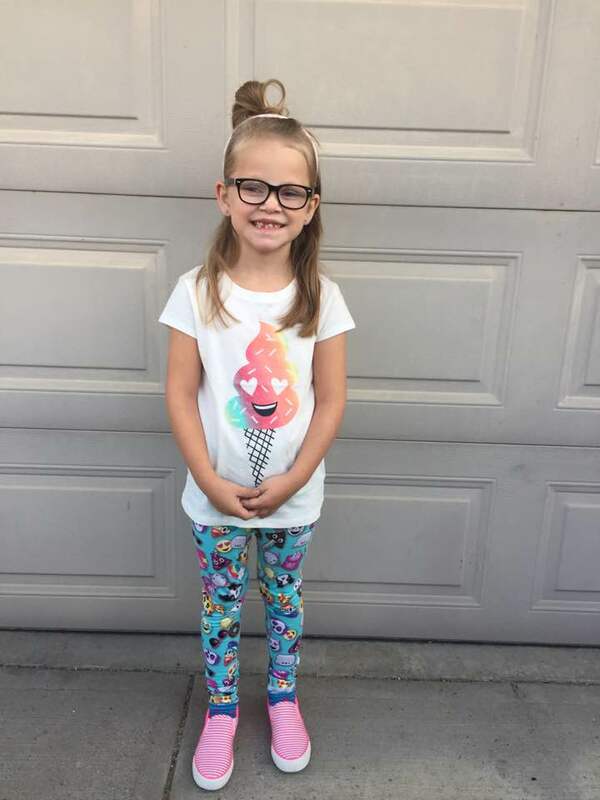 Penelope is going into Grade 2 and had her outfit planned for a very long time. We bought the shirt at the gap at the beginning of August and she decided them that was what she was wearing and then for birthday we got her the leggings which match her backpack and her outfit was complete. She got to school to find out that her best friend since kindergarten wasn't in her class this year. She was initially kinda sad but then said it was ok because they will still have recess and lunch time together. When I picked her up, she said she had a great day and knew everyone in her class. Her teacher is really great and gave her a ring pop to commemorate the the first day of school. There was a cute note on it but Penelope threw it out and I don't remember what it said. It didn't last long though because it fell out of her mouth and shattered all over the sidewalk. There was devastation but no tears. 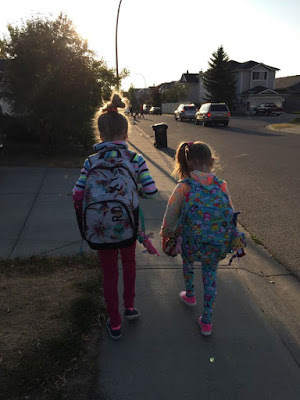 Finley started Grade 3 yesterday and she only planned her outfit last week because she just couldn't decide. I love her shirt so much but it makes me miss Target so much more. It was purchased in Spokane on our way to San Francisco this summer. Her jeans have a rip in them and are almost too short for her. They are favourite pair and she loves the natural ripped out knee aspect of it. Penelope doesn't understand why she would want to wear such a thing haha. Finley has a group of 3 best friends who have been together since kindergarten but they were finally split up this year. Finley and one of them are in the same class while one is another class and another in the last grade 3 class. They all figured that this was going to happen so none were too surprised but still a little sad. But like Penelope, they all ate lunch together and hung out at recess so it is still all good for her and her friends too. Walking to school this morning. I meant to take a photo at the tarmac before school started but it was absolute chaos and by the time I figured out which kid was in which class and met their teacher and figured out where they were going to line up, it was too late. We have a new principal this year and this was the first year we weren't told ahead of time who they were going to have which led to even more chaos then usual. There were a lot of unhappy parents this morning especially from those who have kids who suffer from anxiety. It was not a great situation for them. 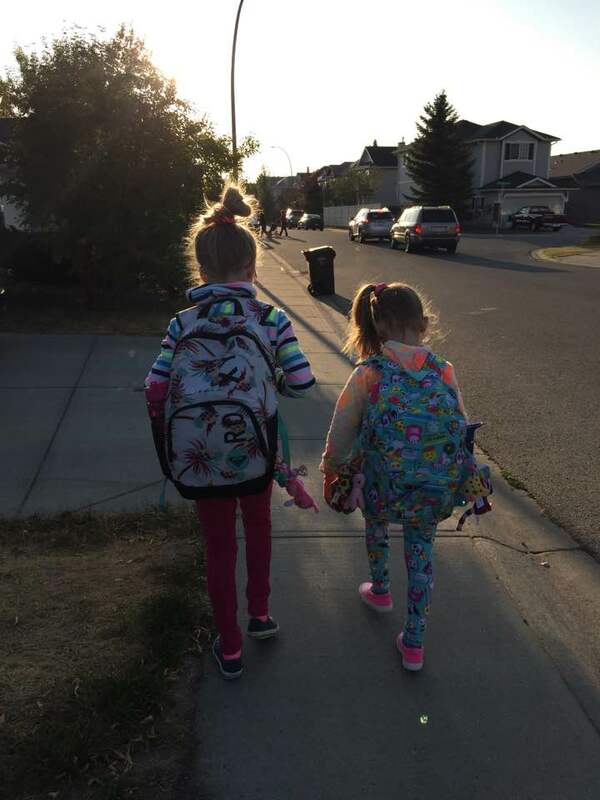 This also marks the first time I didn't cry walking home from school - last year I did because Penelope was gone all day, the year before it was because Finley was in school all day and Penelope was in kindergarten and the year before that it was because finley was in kindergarten. I was more excited then ever before and there was no sadness anywhere to be found haha. I think Pizza was a little lonely today though. A tradition in our house on the first day of school is cupcakes! 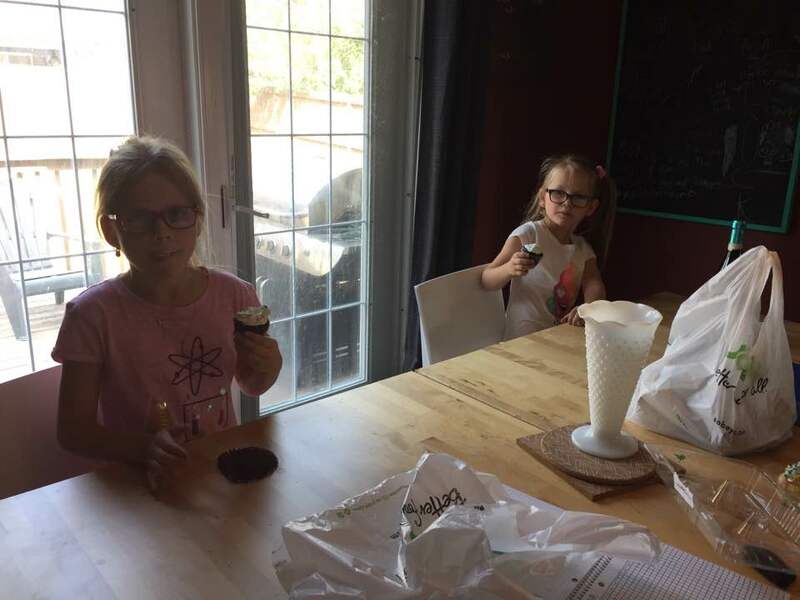 The girls talked about their day all the way home and then we celebrated with cupcakes before having an early supper and getting ready for soccer.